Dr. Csaba Fulop received his Ph.D. from Rush University, Chicago in 1995. His thesis work focused on the molecular biology of the large cartilage proteoglycan (aggrecan), particularly the species-specific alternative splicing of the epidermal growth factor-like domains of the molecule. After graduation, he joined the Department of Biomedical Engineering at the Cleveland Clinic Foundation, where he is currently a Research Associate. His current work focuses on the molecular biology and transcriptional regulation of hyaluronan synthase 2 and hyaluronan binding proteins (versican, TNF-stimulated gene-6) in the cumulus-oophorus system. Synthesis of hyaluronan and its organization into an extracellular matrix are processes involved in successful ovulation and fertilization in most mammals, including human. This article describes concepts regarding these processes based upon recent research, primarily with rodents. Prior to the circulating gonadotropin surge, a murine follicle destined for ovulation contains ~50,000 granulosa cells distributed in several layers around a central cavity, with the outermost cells adherent to a basement membrane, Fig. 1. The oocyte, arrested at the prophase of the first meiotic division, is surrounded by ~1,500 closely adherent cumulus cells to form a compact cumulus cell-oocyte complex (COC) in which the cumulus cells maintain intercellular communication with the oocyte and each other via an extensive network of gap junctions. The follicular fluid bathing the COC contains macromolelules synthesized locally as well as some derived from the serum through the extensive network of capillaries present in the thecal connective tissue surrounding the follicle. At this stage, however, a blood-follicle barrier makes the follicle impermeable to large serum proteins. The serum gonadotropin surge initiates a remarkable series of events which culminate ~14 hours later with ovulation of a highly expanded COC. These include: 1) resumption of meiosis by the oocyte; 2) disassembly of most of the gap junctions; 3) permeabilization of the follicle to large serum proteins including an essential molecule for matrix formation, inter-alpha-trypsin inhibitor (ITI); 4) synthesis and organization of hyaluronan into an extensive extracellular matrix by the cumulus cells; and 5) detachment of the expanded COC from the follicle wall. Granulosa cells do not synthesize hyaluronan and remain adherent to the basement membrane. At ovulation, the expanded COC is extruded through a rupture of the follicle wall and transferred to the oviduct, while the granulosa cells remain in the ovary and differentiate into luteal cells. This article focuses on: 1) the regulation of synthesis of hyaluronan by cumulus cells, 2) its organization in the expanding matrix, and 3) the roles it may have in ovulation and subsequent events. At the time the mice are injected with an ovulatory dose of human chorionic gonadotropin, there is very little extracellular matrix between the cumulus cells in the COC. Indeed, histological staining with a biotinylated probe specific for hyaluronan reveals little if any of this macromolecule within the follicle, Fig. 2. By 5 hours, the presence of a hyaluronan matrix around the cumulus cells is apparent, and the COC is partially expanded. During the following hours, a progressive accumulation of hyaluronan occurs in the intercellular spaces; and shortly before ovulation, the COC reaches its maximal expansion to ~20 times its initial volume1. Hyaluronan is the predominant macromolecule in this matrix and is present at ~0.5-1 mg/ml. The attraction of water by the expanded domain of this large, polyanionic molecule is most likely responsible for the expansion of the preovulatory COC. Fig. 2　Localization of hyaluronan in pre-ovulatory follicles1. A biotinylated hyaluronan-binding protein was used to localize hyaluronan specifically in mouse follicles at times of 0 hour, 5 hours and 10 hours after injection of an ovulatory dose of human chorionic gonadotropin. The COC is indicated in each section. Hyaluronan synthesis by cumulus cells in vivo appears to be controlled at the level of transcription of the mRNA for hyaluronan synthase-2 (HAS2). This mRNA is absent initially in the cumulus cells in the compact COC, but appears a short time later (within an hour) after initiating the COC expansion process by injecting human chorionic gonadotropin in suitably primed mice, and prior to the actual onset of hyaluronan synthesis. By the time synthesis ceases, the HAS2 mRNA is no longer present in the cumulus cells2. The cellular events required to promote hyaluronan synthesis have been studied extensively by isolating the compact COCs (equivalent to the 0 hour time, Fig. 2) and culturing them in vitro under conditions which promote matrix formation, Fig. 3. When compact COCs are stimulated to expand in culture with follicle stimulating hormone (FSH), hyaluronan synthesis by cumulus cells is first detected 2-3 hours after stimulation, increases to a maximum rate sustained between 4-10 hours, and then declines and ceases by ~18 hours. If transcription of mRNA is inhibited with actinomycin D at 6 hours when hyaluronan synthesis is maximum, net synthesis is decreased to a level equivalent to sustaining the maximum rate for only ~2 hours3. Thus, the half life of HAS2 mRNA, and hence of functional HAS2 enzyme for hyaluronan synthesis in these cells appears to be short, a few hours at most. Fig. 3　Kinetics of expansion and hyaluronan accumulation in COCs stimulated in vitro. The filled circle indicates the level of hyaluronan synthesis in COCs cultured without added FSH. The amount of hyaluronan/cell produced by a COC during ~18 hours of culture at a saturating concentration of FSH is the same as that in a fully expanded COC isolated shortly after ovulation in vivo1. In the absence of FSH, COCs synthesize only ~10% as much hyaluronan, Fig. 3. Further, if the COCs are dissociated and the oocytes removed, the isolated cumulus cells synthesize negligible amounts of hyaluronan after FSH stimulus unless the oocytes or their conditioned medium are added back to the culture4. Thus, cumulus cells must interact with two distinctly different factors for maximal synthesis of hyaluronan: an unknown soluble factor released by the oocyte and FSH. The FSH needs to be present only during the first 2 hours in culture, a time period during which the second messenger, cAMP, reaches maximal levels in response to the hormone. Interestingly, the presence of the oocyte factor is not necessary during the FSH-inductive phase, but its continuous presence is required from 2 hours on to promote and sustain maximal hyaluronan synthesis3. Most likely FSH activates a cAMP responsive element binding protein which acts as a transcription factor for the HAS2 gene, as observed for others genes involved in ovulation. The oocyte factor may influence the steady-state of HAS2 mRNA either by enhancing gene transcription and/or by decreasing the rate of mRNA degradation, Fig. 4. Fig. 4　FA model for regulation of hyaluronan synthesis by FSH (or EGF) and the oocyte factor4 . Interestingly, epidermal growth factor (EGF), like FSH, is present in vivo in the follicular fluid and, in vitro, stimulates maximal hyaluronan synthesis by COCs. This growth factor generates an intracellular signal different from that induced by FSH by binding to a receptor associated tyrosine kinase, Fig. 4. The additive effect of FSH and EGF at suboptimal doses and their similar kinetics of action suggest that they could work in combination in vivo to ensure full expansion. Transforming growth factor beta1 (TGFbeta1) induces hyaluronan synthesis by isolated cumulus cells when either FSH or EGF is present, but at levels only ~60% of maximum. However, TGFbeta1 is distinct from the oocyte factor since antibodies which neutralize TGFbeta1 action do not affect that of the oocyte factor. This observation, of course, does not exclude the possibility that the oocyte factor is a member of the TGFbeta family and triggers similar intracellular signals. Synthesis of hyaluronan per se is not sufficient for organizing an extracellular matrix. Additional molecules synthesized by the cumulus cells5 as well as ITI derived from serum6 are necessary to incorporate the newly synthesized hyaluronan into a matrix around the cells. For example, in the presence of FSH or EGF, but the absence of ITI, COCs in culture synthesize as much hyaluronan; but it is released into the culture medium, and the cumulus cells settle down onto the surface of the culture dish. Further, ITI, which is absent in the follicle before the ovulatory surge, has been immunolocalized to the forming COC matrix on histological sections of ovaries isolated shortly after injection with human chorionic gonadotropin. ITI is an unusual proteoglycan with a single chondroitin sulfate chain attached to bikunin, a trypsin inhibitor. Two additional polypeptides, the heavy chains, are covalently linked to galactosamine residues in the chondroitin sulfate chain via ester bonds between C-6-hydroxyl residues and aspartic acid (Fig. 5). The heavy chains can interact with hyaluronan both through a non-covalent association and by a trans-esterification reaction in which a glucosamine residue in hyaluronan displaces the galactosamine in the chondroitin sulfate chain. These interactions can lead to cross bridges between hyaluronan molecules, a requirement for organizing and maintaining the extracellular matrix. Additionally, cumulus cells synthesize two molecules which can be released from the expanded COC matrix by selective digestion with hyaluronidase. One is a large proteoglycan, perhaps in the versican family, which contains a specific binding site for interaction with hyaluronan, and the other an ~45,000 molecular weight protein. This latter could be another hyaluronan binding molecule, Tumor necrosis factor-Stimulated Gene-6 (TSG-6), since mRNA for this protein, initially absent, is up-regulated prior to the onset of hyaluronan synthesis7. This molecule has a distinct hyaluronan-binding motif similar to those found in many hyaluronan-binding molecules such as the cell surface molecule CD-44 and the link protein from cartilage. Interestingly, it also interacts with ITI by displacing a heavy chain (Fig. 5), a reaction which would greatly enhance cross-bridging of hyaluronan molecules. Exactly how these hyaluronan-binding molecules interact with hyaluronan and with each other to stabilize the COC matrix and how this matrix is anchored to the cumulus cells remain to be determined. Once formed, however, this matrix remains stable throughout the degradative processes involved in follicle rupture and ovulation. Accumulation and organization of hyaluronan between the cumulus cells create a spongy and elastic matrix which may facilitate the extrusion of the oocyte at ovulation. When a small hole is developed in the preovulatory follicle wall, the expanded COC pops through, thereby bringing the enclosed oocyte outside the follicle. The oocyte and the cumulus cells are firmly held by the matrix, so that they are not dispersed during the transient deformation that occurs during ovulation. The expanded cumulus may also act as a mechanical support for the oocyte to facilitate its capture by the fimbria of the oviduct and its transport to the site of fertilization. The matrix of the expanded COC may provide a selective barrier that excludes functionally or enzymatically deficient sperm. For successful fertilization, a sperm must penetrate through the COC matrix. This is enabled by the presence of a hyaluronidase which is tethered to the plasma membrane on the head of the sperm by the lipid on glycosylphosphatidylinositol (GPI-anchored)8. This allows cleavages to be made in hyaluronan molecules in the matrix that come in direct contact with the sperm head (Fig. 6). Thus, the sperm, propelled by its flagellum, can rapidly cross the matrix to reach the zona pellucida surrounding the oocyte, a process that takes only a few minutes. 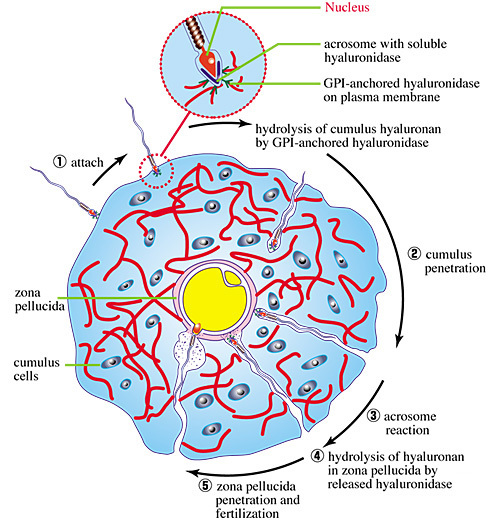 Once contact is made with the zona pellucida, the acrosome fuses with the cytoplasmic membrane in the sperm head and releases its contents, including a soluble form of the hyaluronidase. This would rapidly clear the hyaluronan present in the zona pellucida, thereby helping the sperm to reach the oocyte membrane for fertilization. Fig. 6　Diagram of sperm penetration through the COC matrix. Sperm hyaluronidase activity has been related significantly to the fertilization rate. For example, the ability of sperm to penetrate a highly viscous solution of sodium hyaluronan is correlated with their motility and fertilization efficiency. Hyaluronan penetration is, therefore, used as a method to prepare and evaluate the functional competence of human sperm in assisted fertilization programs. Culture methods of cumulus cells and cumulus cell-oocyte complexes have provided evidence that hyaluronan synthesis is under the control of multiple factors. In addition, for successful matrix formation, hyaluronan must to be organized in the intercellular spaces by locally synthesized molecules and serum-derived proteins penetrating into the follicle prior to ovulation. These findings may open new perspectives to understand physiological and pathological aspects of ovulation and fertilization.